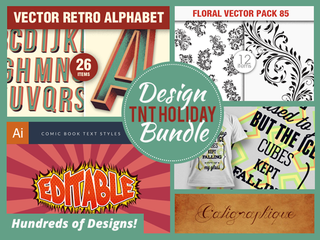 Design TNT has a reputation for high-quality design assets, and in celebration of the holiday season they've assembled their largest bundle ever. This bundle gives you the resources to make personalized cards, invitations, and gifts for the holidays. For a short time, Lifehacker readers can get it for over 90% off. In full, this Design bundle includes vector elements, illustrations, backgrounds, infographics, fonts, brush packs, templates – all themed for the holidays. All files (.ai, .png and .psd) are Mac OSX / Windows compatible.